Joy Behar claimed the president is “psycho” on The View over his remarks on the late Senator John McCain. “I was never a fan of John McCain and I never will be,” said Trump. “He campaigned on repealing and replacing Obamacare for years and then he got to vote and he said ‘thumbs down.”‘ That’s when Behar blew up at Trump supporters, telling them that “you need to examine yourselves!” Well, she got destroyed. You’ll love this. Joy Behar and the rest of the shrews of The View are now trashing supporters of President Donald Trump after he dared to say he isn’t a fan of John McCain. The shrews seem to think they are the “moral compass” for the nation and it’s just inconceivable that anyone who is a good person could support the president after he bashed the late Senator from Arizona. The president was pressed by reporters, asking him why he’s “attacking Sen. McCain seven months after his death?” That’s when Trump went on to explain he blames the late Senator for blowing America’s chance of repealing Obamacare. The president is telling Americans that McCain pulled a fast one, not only on Trump but on the American people. Before any big vote is taken in the Senate or House, the majority or minority whip takes a vote to see where they stand. It’s on the honor system. McCain gave his word that he would vote to repeal and then did not. It was a devastating blow to all Americans. Yet, the shrews of The View refuse to acknowledge what the president said, nor do they care to acknowledge McCain also was part of the deep state. It was a shock to learn the Arizona Senator was the one who leaked the bogus Russian dossier to the press, knowing it was all a lie. 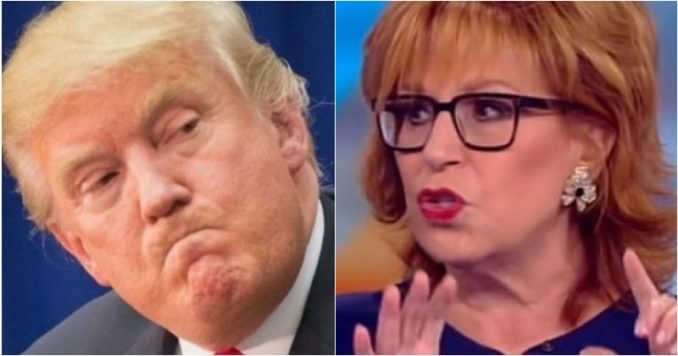 Well, after they played the above clip of the president remarks, Joy Behar led the charge to attack Trump on The View. Of course, Joy is getting her facts from the fake news. The Republicans did have a plan. McCain voted against what was called the “skinny repeal” which would have given the GOP lawmakers more time to hammer out a final deal that the majority could agree on. It also would have struck Obamacare down, making sure Americans no longer would get penalized by the IRS for not having Obamacare. Well, Americans are destroying Joy and the media who continue to go nuts about Trump’s remarks on John McCain. “WHOSE THE PYSCHO, @JoyVBehar, you morons can’t go 1 single day WITHOUT TRASHING OUR PRESIDENT so what if he talked about how John SCREWED the vote on Obamacare, and @SUNNY wants to talk about POLITICIANS BEING OFF LIMITS TO ATTACKS. WHAT DO YOU DUMBASSES DO EVERY DAY,” tweeted Thomas Bulko. “Lol, the Media is really on a John McCain love fest tear, aren’t they? Oh, how can President Trump disparage the great and heroic John McCain?! I have news for the Media. The Conservative base detested John McCain. Trump is only saying out loud what we all think,” tweeted Bill Mitchell. Lol, the Media is really on a John McCain love fest tear aren’t they? Oh how can President Trump disparage the great and heroic John McCain?! I have news for the Media. The Conservative base detested John McCain. Trump is only saying out loud what we all think. Once again Joy and her crew look like fools. President Trump isn’t going to sugarcoat his remarks on McCain and the press are the ones who continue to ask him questions on the late Senator, then the shrews claim Trump is obsessing on McCain. You’ve got to be shaking your head on this circus. President Trump is focused on doing his job. He sees McCain as the one who screwed up his ability to deliver the much-needed replacement for Obamacare. It’s not personal with Trump, but it was for the late Senator. That’s why McCain couldn’t do the right thing for Americans. It was more important to screw Trump with that “no” vote than it was to keep his own promise. That’s just the truth, and Joy Behar can’t recognize the truth, especially when it comes to President Trump. joy boy needs to shut her mouth! no one cares! go somewhere different…thought you were gonna leave the country if TRUMP won….well….leave! go away! big mouth spewing chunks of filth!